Sabra Hummus is the best commercial hummus I have found to date. I have pretty much tried all the traditional store brands you can get in this area, as well as some in NJ, OH and FL. Nothing compares to Sabra and some brands are downright inedible (especially those in OH and FL — people must not eat hummus there). 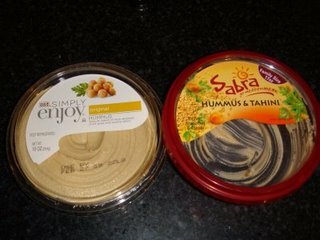 So… when I was shopping at Stop & Shop in Dedham and saw that they had come out with a Simply Enjoy brand of hummus — which, incidentally, was located right next to the Sabra brand and comes in the exact same size and shaped container… I figured, why not? It was almost a dollar cheaper and I have had rather good results and success with S & S’s Simply Enjoy brand. Then I cracked open the Simply Enjoy brand, dragged my finger right through the middle of the container (hey, I was home alone… no one has to know, okay?) and took a taste…. AWFUL… Inedible… It even smelled bad. The conatiner is still in my ‘fridge and will most likely land itself in the sink soon — to be rinsed out and recycled. I can’t eat the stuff. It was bitter, not creamy enough and just didn’t taste good. It was acutally quite bad. I will not be buying it again and will continue to cough up the ridiculous cost of Sabra because it’s just that good.